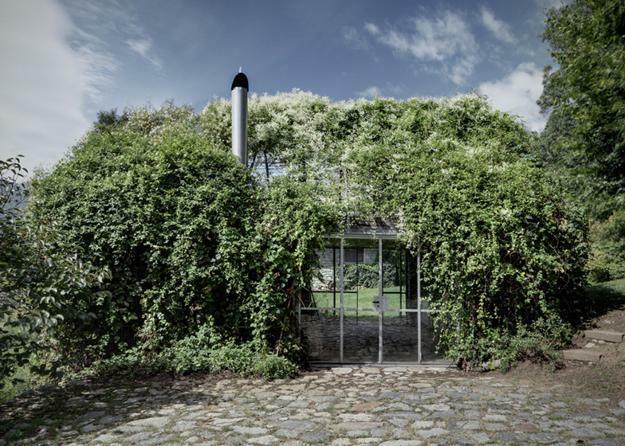 The Green Box is a wonderful garden hideaway and a functional garden pavilion which can be used as a summer kitchen with a dining room, a home art studio, a green house, a storage space and a hobby room. 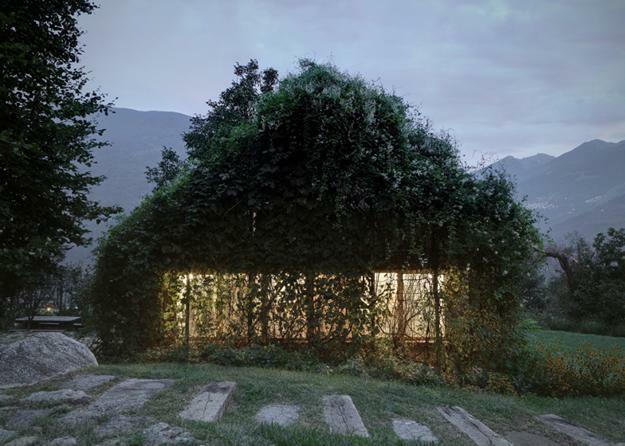 A simple, single-story structure in a natural garden is created by act_romegialli, www.actromegialli.it/ turning an old garage into a green building surrounded by flowering plants. 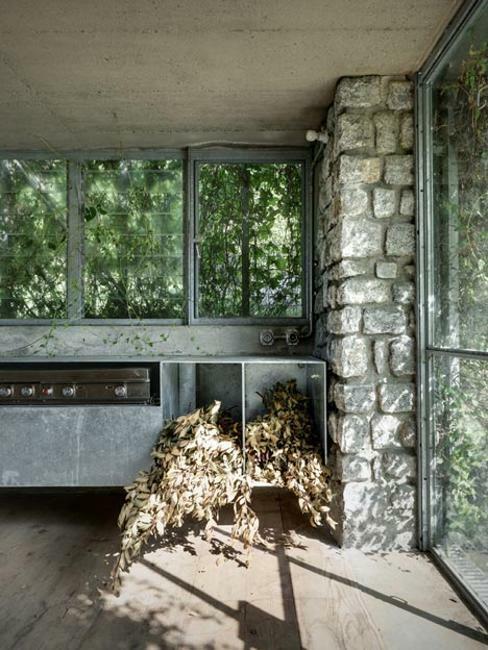 The little green building is a part of a summer house, a weekend retreat in the Raethian Alps, in Cerido SO, Italy. 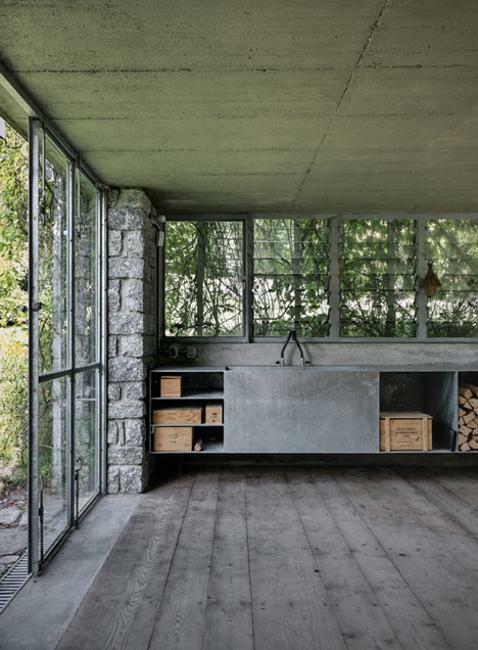 It was converted into a beautiful garden pavilion with storage spaces for gardening tools, a kitchen and a dining room to entertain guests. Retaining the rustic stone walls of the old garage, the architects added a light galvanized metal profiles. Steel wires strung up around the garden pavilion help flowering plants to climb over the facade and walls, creating a beautiful centerpiece to the backyard landscaping. Annual and perennial shrubs are planted around the garden pavilion, creating gorgeous garden design. Interior design divided the former garage space into two rooms. 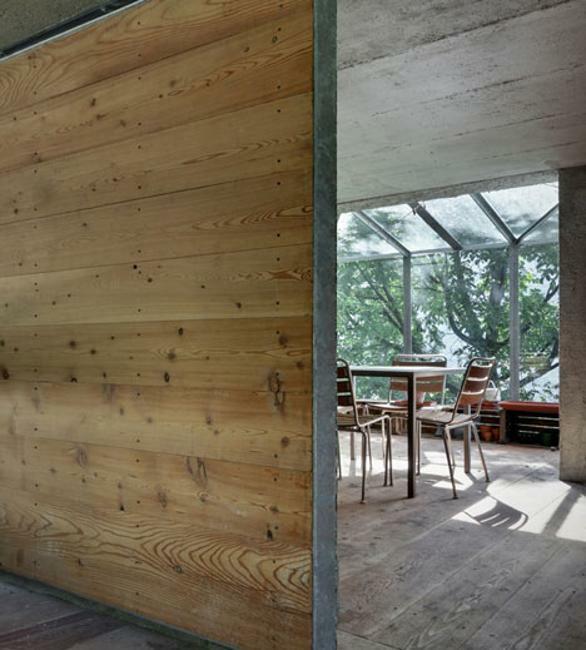 Larch wood floors and exposed concrete ceilings add a warm atmosphere and a contemporary vibe to this garden pavilion. 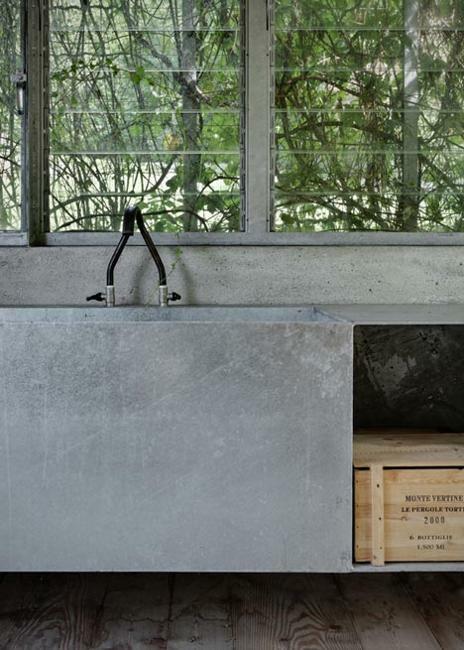 The kitchen has an industrial feel. 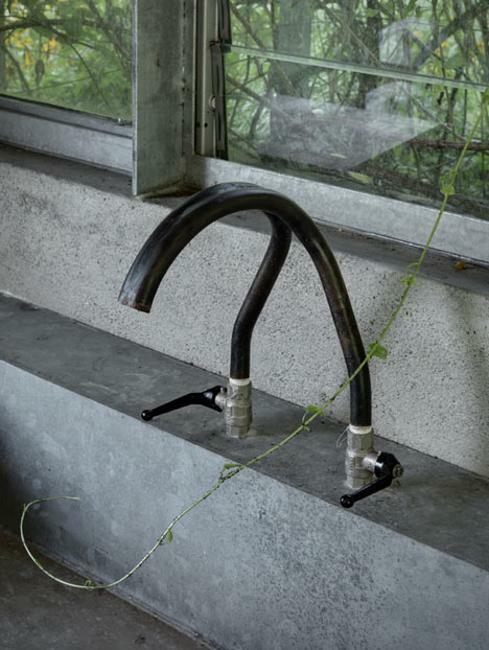 It is constructed from galvanized steel and features a sink with metal pipe taps. Used interior design materials are left rough and simple. 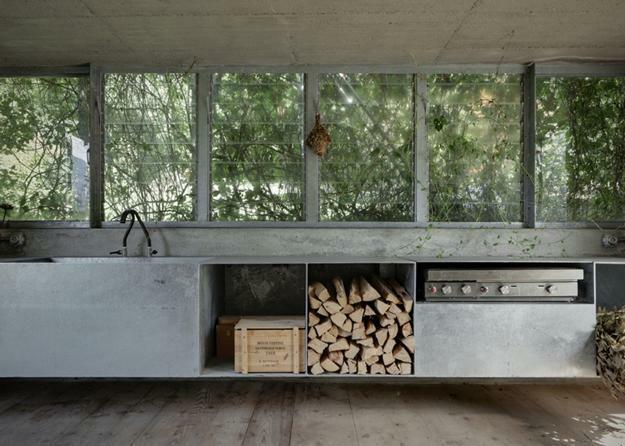 Galvanized steel for the kitchen, larch planks for wooden floors and glass for big sliding doors, windows in unpainted galvanized steel frames, simple pipes for the water supply emphasize the functionality and simplicity of contemporary building. 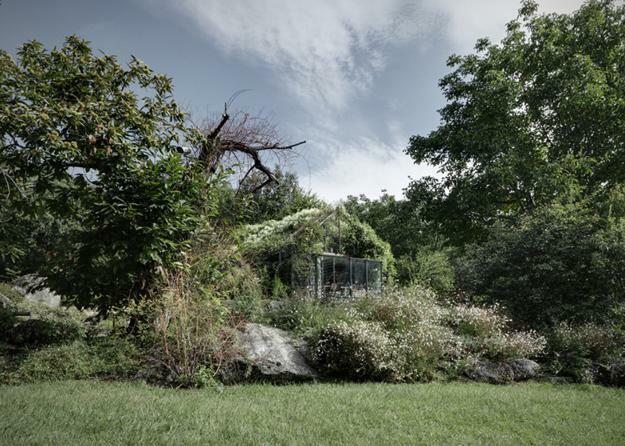 The green pavilion in the natural garden is enhanced by the charming location which allows to see the changing of the seasons and the beauty of natural surroundings. 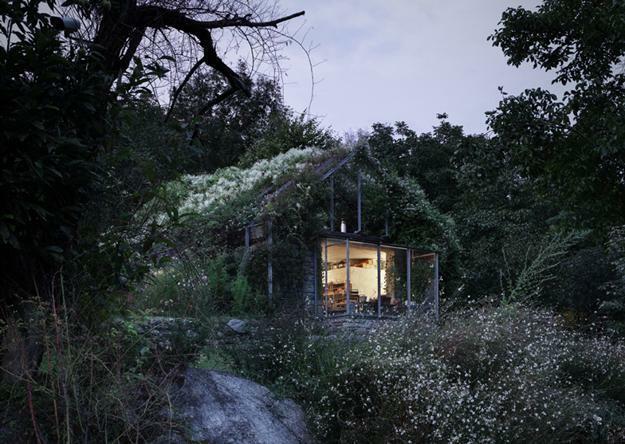 Wild plants and flowers, scattered rocks and mature trees creates a beautiful setting which enhances this garden pavilion design with amazing textures and colors.